Some gardeners have reported a potato cyst (PCN or Potato Cyst Nematode) problem – so do look out for it. This is one of the most serious pests of potatoes and can cause large yield losses. Commonly known as eelworms this is a microscopic soil-borne worm that destroys the root system of the potato plant. Once established in land it takes years (often 20 years or more) before it eventually declines and is undetectable. It is readily spread from field to field by direct movement of soil or by soil attached to equipment such as harvesters and by planting potatoes infected by the pest. When attacked, the leaves turn yellow then black, before the stem becomes affected and the whole plant undergoes an early die-back. Where soil is severely infested, growth and cropping may be minimal. To confirm the presence of eelworm, check in July/early August (you might need a magnifying glass!). 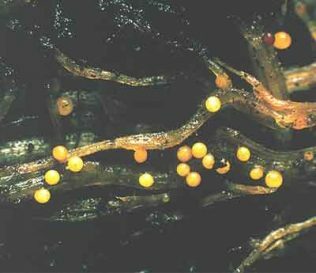 Carefully expose the roots of a potato plant and look for pinhead sized (1mm) white, yellow or brown spherical cysts on the roots. These cysts are the heavily swollen bodies of gravid females – each containing upwards of 500 eggs. Left alone, the cysts will eventually turn brown and the eggs within can remain viable for years, which makes re-infection almost inevitable. Two forms of potato cyst eelworm are commonly found – Heterodera rostochiensis, the golden eelworm, and Heterodera pallida, the white eelworm. It is very difficult for the amateur to identify which type is present. The only time it matters which type is present is when using resistant varieties; the majority are only resistant to the golden eelworm; a few to both. Varietal: Early varieties tend to escape infestation. As a general guide, those varieties exhibiting vigorous growth tend to be most tolerant. 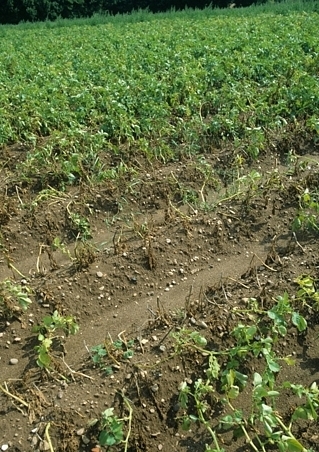 Resistant varieties prevent the formation of cysts, but roots are still damaged by young nematodes, and the plant can exhibit similar yield loss to a non-resistant variety. During the last 10 years a number of varieties have been developed which can keep both potato cyst nematode species below damage and detection threshold, without the use of pesticides. Pentland Javelin, Cara, Maris Piper, Nadine, Nicola, Kestrel, Swift, Sante and Valor, for example, are resistant to the golden eelworm. Kestrel and Sante must be the preferred choice as they also have some resistance to the white eelworm. 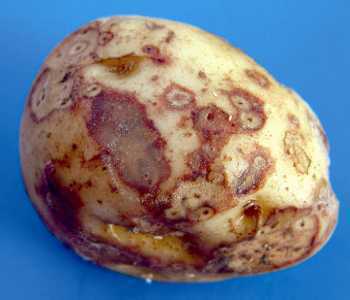 Check resistance levels of different potato varieties on the British Potato Variety Database. Chemicals:Nematicides and fumigants are available but expensive and toxic. Accurate application is essential to achieve adequate control. Use certified seed to avoid introducing the pest. Use a 4 year crop rotation; longer where eelworm is a problem. Tomatoes are also susceptible. Use compost and composted manure to improved the soil. No-dig growing may reduce the effects of eelworm on potatoes. The speed of spread of the potato cyst from area to area can be reduced by cleaning equipment of any possibly infested soil before changing location. Burning the roots rather than adding them to the compost heap is another useful way to control eelworm numbers. After you lift potatoes. planting agricultural mustard may help to reduce eelworm by hardening their cysts and preventing them from emerging on time, confusing their breeding cycle. Be careful though if you have club root because mustard is a brassica and mustard green manure can further spread the disease.